It is not often that the release of a new network interface card picks up some traction in the press, unless it happens to be a Killer Network Interface Card (NIC) that offers virtually lag-free performance, and eliminates the possibility of your NIC being the bottleneck on your gaming rig. This time around, we have something that is somewhat similar on the table, targeting those who want a network card par excellence – the Thecus C10GTR10GbE Network Interface Card. 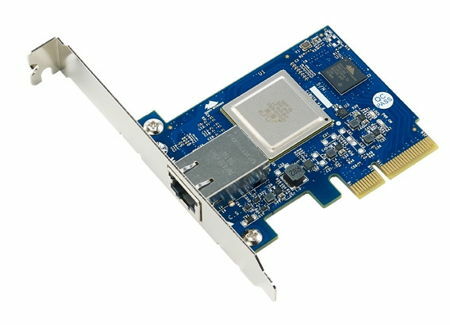 <1–more–>This 10GbE Network Interface Card (NIC) does come with a Tehuti TN4010 processor known as the C10GTR. This is the follow-up to the successful C10GT card, where it functions as the ideal tool for backend throughput for multiple clients, and considering how the adoption of 10GbE environments is starting to spread all the more these days, it proves Thecus’ commitment to staying on top of market trends. The Thecus C10GTR10GbE Network Interface Card will boast of an advanced Tehuti TN4010 processor, and it will play nice with both x4 and x8-sized PCIe slots as well as 100M, 1G, and 10G networks. Some of the software supported by the C10GTR will include Windows Storage Server 2012, WSS 2008 R2, Windows 8, Windows 7, Linux 2.6, Linux 3.x, VMWare 5.x, and Hyper-V. Expect the C10GTR to be fully compliant with a wide range of protocols, including IEEE 802.3az, IEEE 802.3ad Link Aggregation, and IEEE 802.1q VLAN. Expect the C10GTR to retail for $300 apiece.